The ZenBook 13 has the performance, battery life, and visual design of laptops twice its cost. You might be able to play at max graphics settings, but you won’t find a better gaming laptop at this price. ThinkPads are the go-to business brand, and the T480 does it for cheap. The Asus ZenBook 13 UX333 is the best laptop under $1,000. The ZenBook 13 is a budget laptop with high performance thanks to a cutting-edge CPU, a near-premium build quality, and a display that’s worth a lot more than the laptop’s starting price of $850. We’re not just picking our top choice — or the others on our list below — out of thin air. Instead, we’ve reviewed dozens of laptops of all kinds and at all price points, spending hundreds of hours doing so. It’s a Herculean task for sure (and a lot of fun, frankly), and it’s given us some insight into what makes for a good laptop and what holds a laptop back. Maybe most relevant to this “best of” list, we’ve nailed down what you really need in a laptop to make it worth your money at any price. If you’re willing to compromise a bit on a more premium build quality design, the Asus ZenBook UX333FA is an excellent choice. It’s our pick for best laptop under $1,000. It starts at just $850, and for that price, you still get a Whiskey Lake 8th-generation Intel Core i5-8265U processor, 8GB of RAM, and a 256GB solid-state drive (SSD). The upgrade to the absolute latest 8th-generation Intel Core processors is probably the most meaningful update in the newest model moves it past the other laptops in this price category. Those CPUs offer a substantial performance boost, even during everyday use, and they’re also more efficient when you’re not pushing the CPU to the max. Just a few years ago it would’ve been unthinkable that you could find a laptop under $1,000 with graphics card powerful enough to run the latest games without turning the detail settings way, way down. The Dell G3 Gaming is something of a novelty in that regard. Starting at just $800, it features a fast 45-watt Intel Core i5 processor, a 256GB SSD, and an Nvidia GeForce GTX 1050 graphics card. During our time with the G3 Gaming we were consistently impressed by its robust gaming performance — even if we were underwhelmed by its display quality. At this price range, you simply won’t find a better gaming laptop. The G3 Gaming is without peer when it comes to gaming performance on a budget. If you have more money to spend, then you should head over to our best gaming laptops list. Lenovo’s ThinkPad line is renowned for its business chops, offering conservative and consistent good looks with its black chassis and red accents along with strong performance and unparalleled after-market support. Accordingly, ThinkPads tend to be expensive machines, but that’s not universal: the ThinkPad T480 is an excellent laptop that comes in well under $1,000. You’ll find all of the usual ThinkPad business features, including fast 8th-generation Intel CPUs, a full-size Ethernet port for connecting to business networks, and healthy battery life thanks to a solid 72 watt-hours of capacity. Retail prices tend to exceed our $1,000 barrier, but Lenovo almost always has the T480 on sale. Right now, for example, you can score Core i5-8250U, 8GB of RAM, a 512GB SSD, and a 14-inch Full HD display for $850. If you’re looking for a laptop that will fit your business needs, then the ThinkPad T480 is an option that will leave some cash left over for money-making investments. If you’re a student, then you might have even more impetus to save money. That’s where Google’s Chrome OS comes in — it’s been gaining traction in the education market for years thanks to a range of low-cost Chromebooks and its ease of support and maintenance. If you’re looking to check email, write papers, or read Reddit while migrating around campus, then the HP Chromebook x2 is a compelling Chrome OS 2-in-1. Starting at just $600, the Chromebook x2 is very Surface Book 2-like given it’s tear-off display and stable keyboard base. Chrome OS is a little limited compared to Windows 10 (in that you’ll only be able to run web apps and the occasional Android app), but there’s no need to pay for a full Windows machine if you don’t need to do much more. The Chromebook x2 is the best Chrome OS laptop, in our opinion, but if you want more options then check out our best Chromebooks list. The Chromebook x2 performs well during everyday use, has a battery that will see you through a full day of classes and then some, and it’s a thin and light laptop that won’t weigh you down or take up too much room in your backpack. If you’re a creative professional who’s going to be editing photos and video, then you’ll want a discrete GPU to lend a hand. Intel’s integrated graphics are fine for normal productivity work, but even an entry-level GPU like the Nvidia GeForce MX150 can make a laptop much snappier at editing your content. That’s where the Acer Swift 3 comes in. For just $900, you can get an 8th-gen Core i7-8550U CPU, 8GB of RAM, a 256GB SSD, and a 14-inch Full HD display. More important, though, is that you also benefit from the built-in MX150 GPU that applications can access for a little extra performance punch. The Swift 3 is well-built with an all-metal frame, it sports an attractive if simple design, and it should offer enough battery life to close to a full day’s work. Sometimes a typical laptop just doesn’t cut it. If you need a reliable stylus or a mobile workstation with a creative side, the Surface Pro 6 is your best bet under $1,000. Starting at $900, the latest Surface Pro features an 8th-generation Intel Core i5 processor, 8GB of RAM, and 128GB of storage space. It’s a solid performer, and the touchscreen and active pen — which will run you an extra $100 — make this one of the best digital drawing surfaces around. As a 2-in-1 with best-in-class handwriting recognition and Windows Ink, it’s a versatile mobile workstation with features you won’t find elsewhere, at least not at this price. For that reason, it’s hard to beat if you’re looking for something ultra-mobile and stylus-friendly. Is a laptop under $1,000 any good? Should I buy Windows, Mac, or try a Chromebook? What graphics hardware should I look for? Can I afford a laptop with a 4K display? But of course! As we said in the introduction, you’ll want to be careful when buying a budget laptop to be sure that the manufacturer hasn’t cut a corner that you care about. But frankly, the same is true for premium laptops — you can spend over $2,000 and get a laptop that won’t meet your needs if you don’t carefully identify what’s important to you. And consider: the Honda Civic and Toyota Corolla have been two of the best-selling cars for some time now, and there’s a good reason. They’re affordable, safe, provide decent performance, and won’t break the bank when it comes to maintaining them. If you’re looking for basic transportation, then you can’t go wrong with either of these options. The same goes for budget laptops: you aren’t getting a Ferrari, but if what you need is good performance and reliability at an affordable price, then our list proves that you can get quite a bit of computer for well under $1,000. It depends. Specifically, it depends on what kind of tasks are important to you. We suggest that you check out our Windows, MacOS, and Chrome OS buyer’s guide, which goes over the differences between each operating system and some of the advantages and disadvantages of each. Chances are, if you’re looking for a laptop that’s less than $1,000, then you won’t be looking at a Mac unless you’re willing to buy an older model. That leaves a choice between Windows and Chrome OS, which is primarily a question of what software you need to run. If you want the widest selection of software across the most categories, then Windows will be your best bet. But if you just need to browse the web, run simple productivity apps, and can get away with Android equivalents, then Chrome OS could work. This one’s a little easier to answer. Today, you can get a Whiskey Lake 8th-generation Intel Core i5 CPU in laptops that are well under our $1,000 threshold. 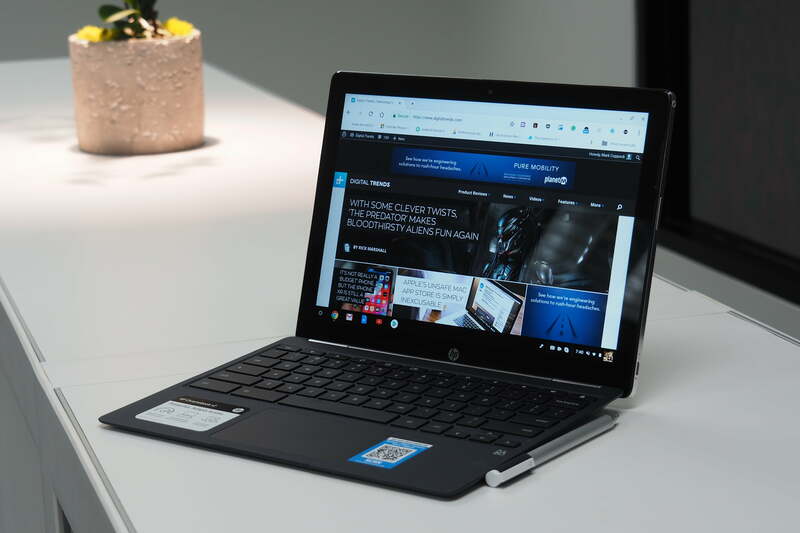 Quite a few of the laptops in our list use the Core i5-8265U, which is a highly capable processor that will churn through most productivity tasks without hesitation. It’s also an efficient CPU, meaning you’ll enjoy good battery life. If you buy a Chromebook, then you can get away with a slower processor, such as an Intel Core i3 or Pentium processor. And, chances are, you won’t find many laptops with Core i7 processors in this price range. That leaves the Core i5 as the most logical — and available — processor choice for budget laptops. The sweet spot for memory — for any laptop, really, not just budget machines — is 8GB. We answer the question of “how much RAM do I need” in more detail in our buyer’s guide, but whether you’re running Windows, MacOS, or even the more lightweight Chrome OS, 8GB will provide you with plenty of headroom for multitasking and more complex applications. Most budget laptops will come with integrated graphics, usually some variant of Intel’s UHD Graphics technology that the company builds into its Core CPUs. That’s going to be good enough for all of your productivity needs and for running casual games or older titles at lower resolutions and graphical details. However, as our list indicates, you can find budget laptops with entry-level GPUs like Nvidia’s GeForce MX150 and GTX 1050. These will provide a much better gaming and content-creation experience than integrated graphics can manage, and if you’re willing to settle for 1080p and lower graphical details, you can get some real gaming done with either of these chips. Probably not — it wasn’t too long ago when you’d struggle to find Full HD displays available for under $1,000. Besides, budget laptops typically don’t pack in as much battery capacity as more expensive machines, and 4K displays are notorious for sucking down power. Even if you could score a 4K display in a sub-$1,000 laptop, you likely wouldn’t be too happy with its longevity away from a plug.